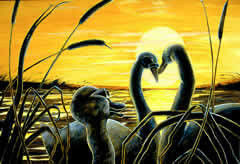 One evening, just as the sun was setting in splendor, a great flock of large, handsome birds appeared out of the reeds. The duckling had never seen birds so beautiful. They were dazzling white, with long graceful necks. They were swans.